Before they set sail for the New World and inspired the holiday of Thanksgiving, the Pilgrims spent several years in Leiden. Brandon Hartley takes a look at a fascinating but often overlooked chapter in the histories of both the Netherlands and the United States and traces the footsteps of these pioneering Americans. 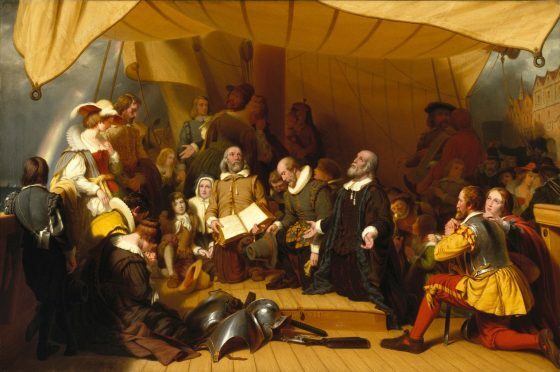 Anyone who spent time in a stateside grammar school is no doubt familiar with the simplified history of Thanksgiving; of the brave Pilgrims that sailed on a ship called the Mayflower to what is now the state of Massachusetts and participated in a feast after being aided by a friendly Native American tribe. But what they may not know is that, long before the Pilgrims hightailed it to the New World, they made a detour to Leiden – one that lasted over a decade. Like many holidays, Thanksgiving is the accumulation of various traditions and historical events that have had their rough-edges and complexities erased in order to make them more wholesome (and marketable). Contrary to popular belief, those who would go on to be dubbed the American Pilgrims weren’t that uptight, especially by the standards of 16th century England. They were hardly religious fanatics and they even smoke and drank on occasion. However, their belief system placed them in the crosshairs of the Church of England. During that period, English followers that didn’t toe the line of the state church were persecuted. This forced the Pilgrims, who were primarily known as the Scrooby Congregation in those days, to keep a low profile. Practising their religious beliefs in public could come with dire consequences. English law deemed it illegal to attend services at an ‘unofficial’ church. Doing so could result in a fine of a shilling for every Sunday and Holy Day, which definitely added up over time. Even worse, if you were caught leading one of these services, it could result in stiffer penalties that included imprisonment or even execution. Beginning in late 1607, one by one, members of the fledgling congregation decided to move to what was then known as the Republiek der Zeven Verenigde Nederlanden (AKA the Dutch Republic). The comparatively tolerant nation would allow them to practice their religious beliefs in peace. There was just one problem: many of them weren’t quite prepared to deal with the Dutch. After a few difficult years in Amsterdam, 100 members who would later be dubbed the American Pilgrims asked the city of Leiden if they could resettle within its gates. At the time, Leiden was an industrial centre with successful textile, brewing, and other industry which was a good fit for a group of outsiders who barely spoke Dutch. These trades didn’t require sophisticated skills or an expansive knowledge of the local tongue. Many of members of the ‘Leiden Congregation’ did pretty well in the city. Led by pastor John Robinson and an entrepreneur named William Brewster, they managed to increase their congregation to roughly 300 followers. Brewster eventually took a job teaching English at Leiden University and started a publishing company along with a colleague named Thomas Brewer. Together, they printed religious books that were exported to England. Later, Robinson enrolled at the university to pursue a doctorate in 1615. By many accounts, being a doctoral student in those days came with some fantastic benefits. In addition to not having to participate in night watches along the city walls of Leiden or help maintain them (a mandate for many adult males living in the city), Robinson was allowed to purchase wine and beer tax free. Nor did he have to house Dutch troops in his home, which was also a law as the Eighty Years’ War with Spain continued to drag on. Robinson instead spent his time studying when he wasn’t participating in religious debates. But other Pilgrims weren’t so fortunate. To help them while they struggled to adapt to Dutch culture, Robinson and three others invested in property near the city’s Pieterskerk and paid for the construction of 21 houses so they’d at least have a roofs over their heads. This area became known as the Engelse Poort (English Gate). While the Pilgrims no doubt appreciated the country’s tolerance and their new neighbours’ willingness to let them worship however they wanted, many of them came from rural backgrounds and had received little, if any, education. This made finding work difficult and improving their Dutch skills all but impossible. There was also the local culture, which the group largely considered far too liberal and immoral for their tastes. Around 1617, the cracks really started to show. Hard manual labour had caused many of the Pilgrims to suffer ailments that made working long hours a nightmare. Others had blown through their savings or simply became homesick, opting to return to England rather than stick it out in Leiden. Harsh working conditions and the Dutch’s libertine ways made trying to recruit new members from their native land difficult, to say the least. But perhaps the most troubling aspect for them was what was happening to their children: they were growing up Dutch! For many Pilgrim parents, it was terrifying to watch their offspring ignore their religious teachings, lose their English skills, and gradually adopt the ways of the culture surrounding them. As these kids came of age, several of them decided to leave the congregation to search for employment and other opportunities elsewhere. As Bradford put it, they were being ‘drawn away by evil examples into extravagance and dangerous courses’. Fearing that their congregation would completely fall apart for these reasons and the lingering impact of the ongoing Eighty Years’ War, the Pilgrim leaders decided to go looking for a place their followers wouldn’t be persecuted or tempted by what they considered sinful vices. After mulling over various options that included setting sail for northeastern South America, the Pilgrims made plans to move to what would become New England. But further complicating matters was Brewster’s stubborn insistence on meddling with political affairs back home in England. After he used his printing press to churn out a series of political pamphlets that he sent to Scotland to badmouth the monarchy, King James himself ordered his arrest. Brewster was forced to go into hiding to avoid agents sent to Leiden by the English ambassador. While they never managed to apprehend him, they did seize his printing press and arrest Brewer, who was later sentenced to 14 years in prison. Brewster later managed to make it onto the Mayflower before it set sail for the Plymouth Colony in September of 1620. But not all of the Pilgrims went on the voyage. Those chosen to leave were primarily the youngest and strongest among them. The rest of the congregation was expected to join them on a future trek after their new home was successfully established. Only a few dozen Pilgrims joined the initial crossing. The remainder of the ship’s passengers were made up of experienced sailors and various ‘hired hands’ from England that were eager to seek better lives in the New World. Robinson opted to stay in Leiden to lead those who remained while, Brewster, despite his questionable behaviour, was chosen to help lead the expedition to the New World. Robinson did what he could to keep the congregation together but the economic and cultural influences around them took their toll, especially as many members joined the colony overseas as planned. Robinson became ill and incapable of making the journey across the Atlantic. Following his death in 1625, many of those who were still living in Leiden set sail for the Plymouth Colony. Some of those who remained joined the Dutch Reformed Church. Others even opted to convert their last names to Dutch. For example, ‘Coit’ became ‘Koet’ and ‘McRae’ became ‘Makreel’. Within a few decades, the declining congregation in Leiden had faded away but those who moved to North America left an indelible mark on the New World. In addition to establishing a successful colony, several of their ancestors went on to become US presidents. Franklin D. Roosevelt, both George and G.W. Bush, and Barack Obama all had relatives who were Pilgrims. How much the Pilgrims’ time in Leiden contributed to Thanksgiving is open to debate. According to one theory, it may have been at least partially inspired by Drie Oktober. It’s the name for an annual festival that commemorates a crucial Dutch victory over Spain that took place in Leiden in October of 1574. The Pilgrims would have no doubt witnessed, or even participated in Drie Oktober during their years in the city. Back then, it would have involved feasts, military exercises, and plenty of other festivities that would have dragged on for days. There’s a good chance the Pilgrims had Drie Oktober on their minds when it came time to celebrate after one of their first harvests in the New World. However, other traditions and factors could have contributed to the celebration. Letting one’s hair down following harvests was a European tradition that dated back centuries. Historians also point to a passage in the Biblical book of Deuteronomy that outlines how to properly celebrate a harvest. One of the traditions? Asking strangers and neighbours to join the festivities, which is one of the reasons why they probably extended the invite to the Native Americans. Despite the Pilgrims’ years in Leiden largely being treated like an historical footnote at best, the city itself hardly shies away from it. Visitors to the Pieterskerk, the final resting place of Robinson and several other Pilgrims, will find a large marker outside that honours the Mayflower expedition. 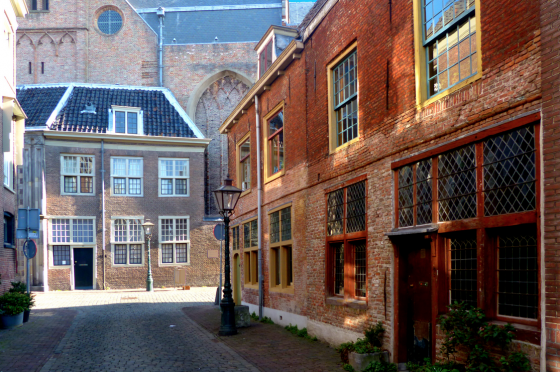 Those eager to learn more can also visit the Leiden American Pilgrim Museum. 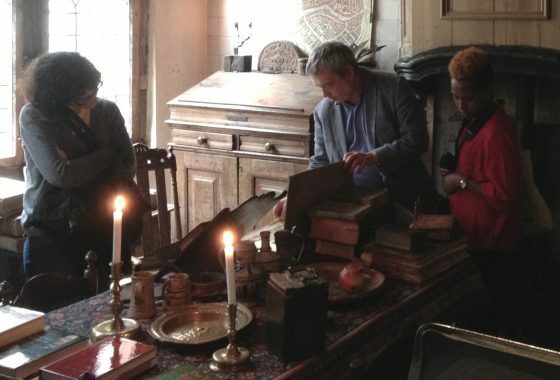 Located in a 14th century house, it contains furniture and artifacts that date back to the Pilgrims’ years in the Netherlands. Tours are held every Thursday, Friday, and Saturday, excluding holidays. Its director, Jeremy Dupertuis Bangs, is also the author of the extensive Strangers and Pilgrims, Travellers and Sojourners: Leiden and the Foundations of Plymouth Plantation. Needless to say, it contains far more information than could be squeezed into this article and you can purchase a copy by clicking here. The Pilgrims didn’t have their own church while they lived in Leiden so they often used preexisting ones for days of worship, weddings, funerals, and other events. The Vrouwenkerk was one of them and it catered to the Pilgrims and other religious refugees from England. 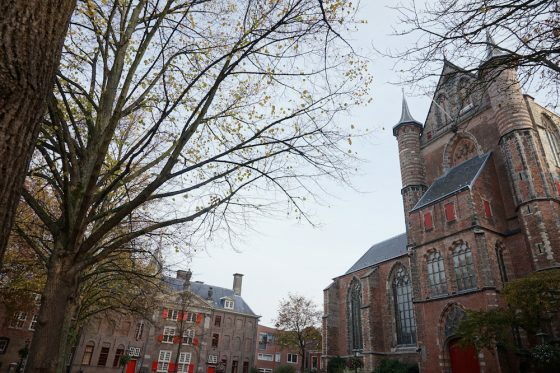 Every November on Thanksgiving morning, the Pieterskerk hosts an annual ecumenical service. You can learn more about the event here. If that wasn’t enough, the Pieterskerk is also home to a new Pilgrim-themed escape room. Reservations for the 60-minute Mayflower Escape Room, which is offered in both English and Dutch, can be booked here.